Annual row crops dominate agriculture around the world and have considerable negative environmental impacts, including significant greenhouse gas emissions. Transformative land‐use solutions are necessary to mitigate climate change and restore critical ecosystem services. 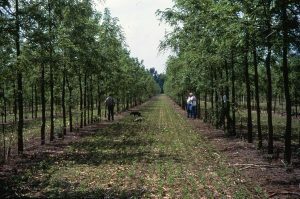 Alley cropping (AC)—the integration of trees with crops—is an agroforestry practice that has been studied as a transformative, multifunctional land‐use solution. In the temperate zone, AC has strong potential for climate change mitigation through direct emissions reductions and increases in land‐use efficiency via overyielding compared to trees and crops grown separately. In addition, AC provides climate change adaptation potential and ecological benefits by buffering alley crops to weather extremes, diversifying income to hedge financial risk, increasing biodiversity, reducing soil erosion, and improving nutrient‐ and water‐use efficiency. The scope of temperate AC research and application has been largely limited to simple systems that combine one timber tree species with an annual grain. We propose two frontiers in temperate AC that expand this scope and could transform its climate‐related benefits: (i) diversification via woody polyculture and (ii) expanded use of tree crops for food and fodder. While AC is ready now for implementation on marginal lands, we discuss key considerations that could enhance the scalability of the two proposed frontiers and catalyze widespread adoption.